Whether given in an Easter basket or just as a gift, everybunny loves a stuffed rabbit this time of year. We scoured Etsy for the coolest, craftiest, and most eco-friendly rabbits of them all to come up with this list of the seven best Easter bunnies. Many of these bunnies had lives before their hoppy long-eared existences as they're upcycled from sweaters, pants, and other previously loved clothing. Check them out to decide which bunny you think deserves a spot in your kid's Easter basket. Oh what a sweet, sleepy looking bunny — and what a story he has indeed! This little rabbit was handmade in Canada from a very special angora sweater given to the designer’s friend by her favorite aunt. What’s even sweeter than a sweater gaining new life as a soft plushie friend for a child? A portion of this bunny’s money will be donated to another one of designer’s friends who lost her family home and art gallery in Shiogama, Japan. The classic Easter Bunny gets a funky twist with Miracle Mittens one-of-a-kind, hand-crafted creations of Jack the Rabbit. These funny bunnies are made from upcycled woold-blend sweaters and they’re wearing pants made from an uncycled men’s houndstooth suit jacket. 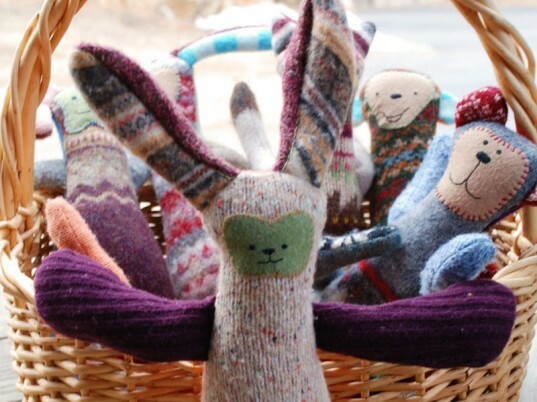 Just the bunny for Baby’s first Easter — Wood Pond Design’s short-eared rabbits are handmade from upcycled, re-purposed wool sweaters. The rattle sewn inside offers a soothing sound for little ones. Drool, spit up and other gooey baby messes are inevitable, but luckily these rattles can be hand or machine washed. If you’re feeling crafty, Chunky Chooky’s sew-your-own organic softie project kit is the way to go this Easter. 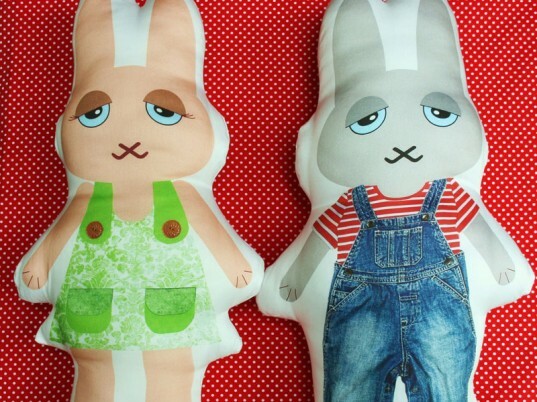 You’ll get certified organic fabric printed with the front and back of both Rafferty and Regina Rabbit. Plus, the kit includes easy-to-follow instructions and enough eco-friendly corn fiber toy filling to fill out the 16-inch tall plush bunnies. These aerodynamic rabbits look like they could fly through the air toward an Easter egg target and each piece of their upcycled bodies have lived a life before this life as rabbit. These bright-colored plushies are handmade from upcycled corduroy pants, repuposed upholstery fabric, scrap fleece, eco felt, vintage buttons, recycled polyfill stuffing, and even the tail is faux fur from a thrift store stuffed animal. 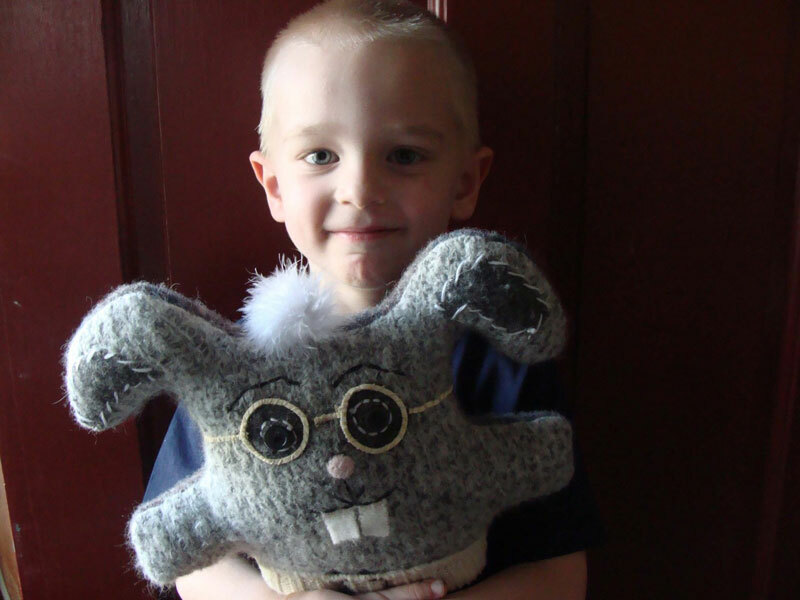 Each eco-friendly Switter Critter Bunny is one-of-a-kind, handmade from reclaimed, felted wool sweater pieces, making it a very special Easter rabbit for your child. At 18-inches tall, these bunnies are fun to tote around the house, tuck into bed, and snuggle with. Beyond bunnies, Colorado designer Curious Lottie crafts all kinds of Switter Critter animals for collecting including a bear, kitty, owl, dog and monkey. What’s better than one bunny? A whole set of miniature bunnies of course! This long-eared family is hand sewn from eco-friendly felt. Because these bunnies are tiny, they’re best for older kids. Make it Awesome Blue Bunny Bunny, $36 Oh what a sweet, sleepy looking bunny -- and what a story he has indeed! This little rabbit was handmade in Canada from a very special angora sweater given to the designer's friend by her favorite aunt. What's even sweeter than a sweater gaining new life as a soft plushie friend for a child? A portion of this bunny's money will be donated to another one of designer's friends who lost her family home and art gallery in Shiogama, Japan. Miracle Mittens Jack the Rabbit, $26 The classic Easter Bunny gets a funky twist with Miracle Mittens one-of-a-kind, hand-crafted creations of Jack the Rabbit. 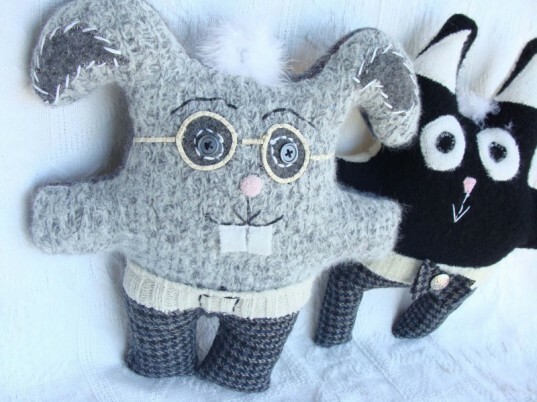 These funny bunnies are made from upcycled woold-blend sweaters and they're wearing pants made from an uncycled men's houndstooth suit jacket. 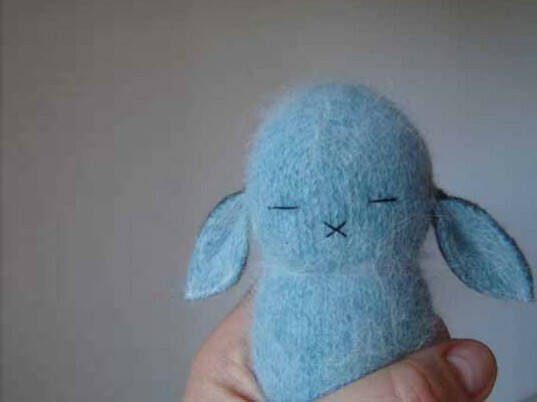 Wood Pond Designs Handmade Plush Bunny Rabbit Baby Rattle, $14 Just the bunny for Baby's first Easter -- Wood Pond Design's short-eared rabbits are handmade from upcycled, re-purposed wool sweaters. The rattle sewn inside offers a soothing sound for little ones. Drool, spit up and other gooey baby messes are inevitable, but luckily these rattles can be hand or machine washed. Chunky Chooky Organic Softie DIY Regina and Rafferty Rabbit, $40 AUD If you're feeling crafty, Chunky Chooky's sew-your-own organic softie project kit is the way to go this Easter. You'll get certified organic fabric printed with the front and back of both Rafferty and Regina Rabbit. Plus, the kit includes easy-to-follow instructions and enough eco-friendly corn fiber toy filling to fill out the 16-inch tall plush bunnies. 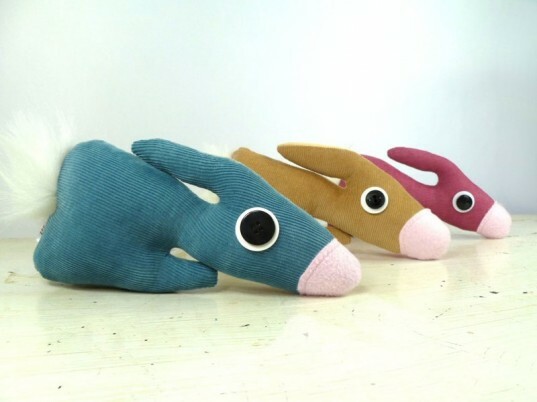 Art Tales Handmade Plush Rabbit, $16 These aerodynamic rabbits look like they could fly through the air toward an Easter egg target and each piece of their upcycled bodies have lived a life before this life as rabbit. These bright-colored plushies are handmade from upcycled corduroy pants, repuposed upholstery fabric, scrap fleece, eco felt, vintage buttons, recycled polyfill stuffing, and even the tail is faux fur from a thrift store stuffed animal. 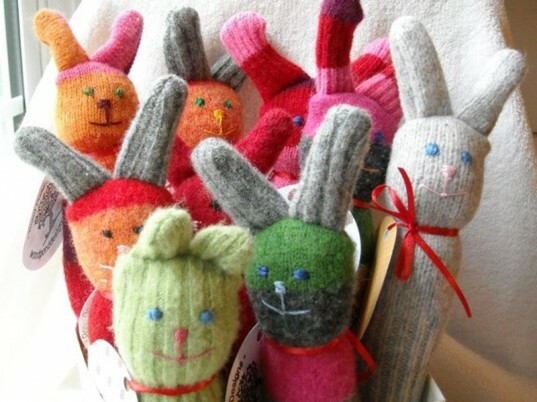 Curious Lottie Switter Critter Bunny, $38 Each eco-friendly Switter Critter Bunny is one-of-a-kind, handmade from reclaimed, felted wool sweater pieces, making it a very special Easter rabbit for your child. At 18-inches tall, these bunnies are fun to tote around the house, tuck into bed, and snuggle with. Beyond bunnies, Colorado designer Curious Lottie crafts all kinds of Switter Critter animals for collecting including a bear, kitty, owl, dog and monkey. 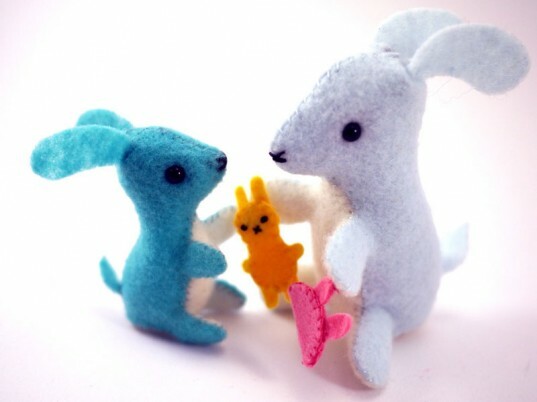 LittleFluffStuff Eco-Friendly Felt Mommy and Baby Bunny, $9.99 What's better than one bunny? A whole set of miniature bunnies of course! This long-eared family is hand sewn from eco-friendly felt. Because these bunnies are tiny, they're best for older kids.